Posters must be submitted to itsmultimedia@siue.edu. Questions can be emailed to itsmultimedia@siue.edu or by calling the Help Desk at 618-650-5500. Hot lamination is two sided clear transparent film. Materials for hot laminations can be no larger than 36 inches wide and should be no thicker than 14-ply poster board. Heat sensitive materials will be damaged by this process. Two types of Cold Lamination are available - a clear contact adhesive that can be used to adhere to most flat surfaces and a two sided clear glossy film. 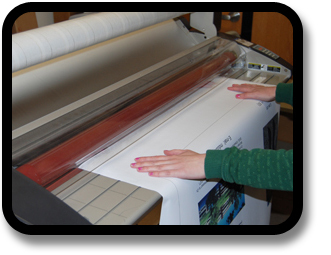 Materials for cold laminating should be no larger than 24 inches wide. Students wanting to have laminating done can come to the ITS office located in the basement of Lovejoy Library, room 0005. Our regular office hours are Monday through Friday 7:30am-4:30pm. Break week hours may vary. If you have questions please call the Help Desk at 618-650-5500. 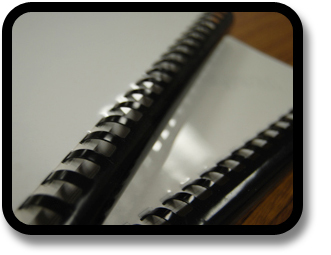 Comb binders are 11 1/2 inches long and range from 5/16th inch to 2 inches in thickness. Clear plastic and manila covers are also available. Materials to be comb bound should be no thicker than heavy card stock. Students wanting to have comb binding done can come to the ITS office located in the basement of Lovejoy Library, room 0005. Our regular office hours are Monday through Friday 7:30am-4:30pm. Break week hours may vary. If you have questions please call the Help Desk at 618-650-5500. 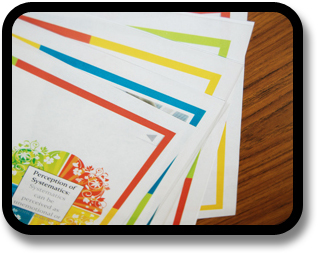 Transparencies are available to print for classroom or conference presentations. Students wanting to have transparencies done can come to the ITS office located in the basement of Lovejoy Library, room 0005. Our regular office hours are Monday through Friday 7:30am-4:30pm. Break week hours may vary. If you have questions please call the Help Desk at 618-650-5500. Students can request posters for Senior Showcase, Capstone Presentations, Senior Assignment Presentation, & Graduate Symposium Presentations. Please submit your print ready poster to itsmultimedia@siue.edu. Print ready - meaning your poster is sized correctly, spelling and grammar errors have been fixed, and images have a high enough resolution. When the poster is complete, we will send an email to you with the cost and location to pick up the poster. Our office is located in the basement of Lovejoy Library, room 0005. Our regular office hours are Monday through Friday 7:30am - 4:30pm. Break week hours may vary. If you are unable to pick up your poster during these hours, please specify who will be picking up your poster. PowerPoint and Publisher Posters - Please keep in mind when submitting posters created using a Mac computer, the formatting and fonts may be different when we open them up on our Windows computer. If you are wanting to keep the same formatting and fonts used on your Mac computer, it is recommended that you save your poster as a PDF. PowerPoint Videos - SIUE faculty, staff, and students can use PowerPoint to capture their voice over slides. Once each slide has been recorded the presentation can be saved as a mp4 video file. The file can then be saved to owner's OneDrive account. The file can also be added to the streaming server. To add a video to the streaming server, videos will need to be either shared with Production Services staff in OneDrive or the video can be brought over, on a thumb drive, to the ITS office located in the basement of Lovejoy Library, room 0005.